If you need a ceiling fan to move the air around your room, I have discovered there are many choices to match your personality. After all, just because it is on the ceiling don't think that it wont be noticed. I have found some to be pretty ugly! This one is rated for outdoors as well, so you could use it on a covered porch, but would look awesome inside too! Very oil rubbed bronze look with the two fans that not only look good they move the air double time. This one definitely ticks all the boxes off for the industrial/warehouse/rustic look. 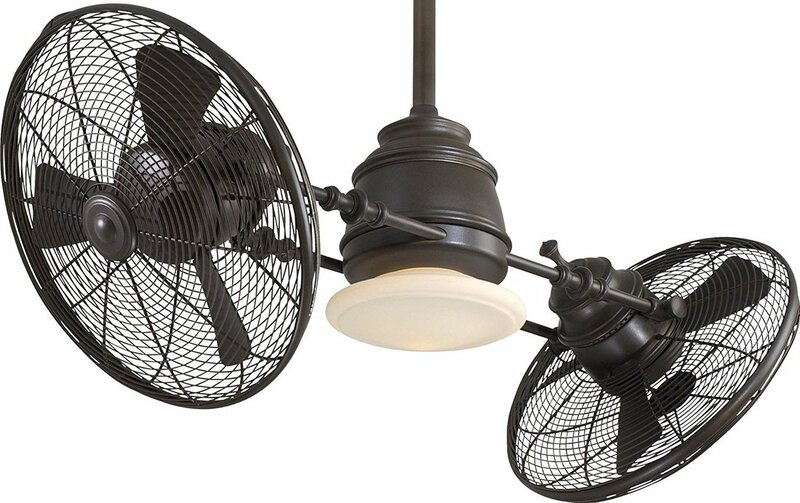 Two fans to help move the air around in that rustic metal caged style with a center light. This will definitely be noticed and useful at the same time. Only 23 inches diameter, it can still move the air around and has a hand held remote control to turn off and on quickly. This caged drum style is definitely unique and looks good on the ceiling. This would work in a room where you don't have the height to have a down rod as this sits closer to the ceiling. This one is definitely unique as it has the motor installed to one side and then a pulley system for the fan that is installed away from it. It is visually good to look at and still moves the air around. This is very old world or industrial styling for sure and something a little different. This one mixes contemporary with old world industrial. If you like a mixture of traditional and rustic, this one has a rubber antique copper finish with rectangle blades and a caged light for that warehouse look with remote control for speed. If you like unique, this one is a mixture of ornate unique, traditional and industrial styling. If you really need the air to move, this one is a turbo fan with a light. I know this page is supposed to be about industrial ceiling fans, but I thought I would include this fan on a pedestal as another option to move the air around without losing that warehouse industrial look. This way you don't have to mess with the ceiling or install wiring if there is not any there now which can get expensive. If you rent this is another option as well. This is on a tripod and if you get a couple for opposite corners, they will look good and also be functional. Ceiling fans are very common now, but they don't have to look common. If you want something a little different, I found the above units online, just click on the picture or link to find out more and to maybe get inspired by all the different styles available. Anything utilitarian can still be a part of the room! Instead of trying to hide fixtures, lights and fans, make them a part of the room so that they can be seen for what they are as well as their styling. Have fun! Also see my other pages for more Industrial Home Decor Ideas!